Marloth Sanbonani - Marloth Park Accommodation. Marloth Park Sanbonani is a neat affordable and private self catering holiday home situated a 100 metres from the Crocodile River, which forms the southern boundary of the Kruger National Park. You are close enough to the river to enjoy walks and views of the Kruger National Park, yet secluded and private to enjoy a relaxing holiday in the beautiful holiday township of Marloth Park. The house comfortably sleeps 6 people in two airconditioned, ensuite bedrooms with double beds as well as a bunk bed in the open plan kitchen.There is a fully equiped open plan kitchen. Linen and bedding is provided. But please bring your own swimming towels if you plan to visit the municipal swimming pool or the swimming pool at Die Watergat. The Chalet is fully equip with all utensils and cutlery, microwave, fridge and stove. We have also include fire lighter and braai utensils. There is no television in the house but there is excellent Vodacom reception to stream live sports or movies. Outside, there is a splash pool a braai and covered parking. Day night switch has been installed and will illuminate automatically around the chalet at sun down. A variety of wildlife visit the property, including zebra, warthog, ostrich, giraffe, and various buck. Although many of these animals have become somewhat habituated to humans, please treat these animals with the utmost respect keeping in mind they are still wild life animals. The Crocodile Bridge entrance gate to the Kruger National Park is only 17 kilometres away. Marloth Park has a supermarket, butchery, liquors shop, DIY, petrol station 3 restaurants and an ATM. 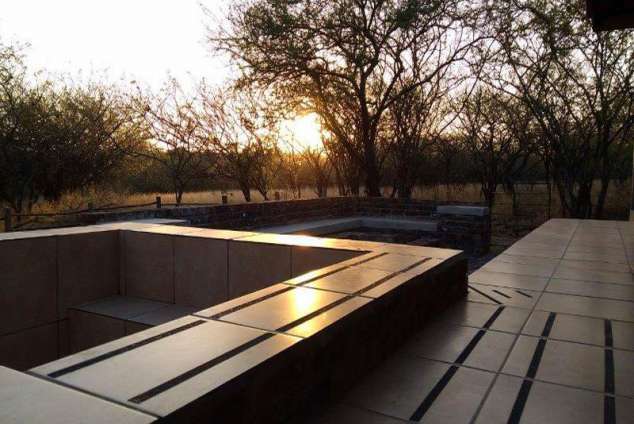 Detail description : Marloth Park Sanbonani is a neat affordable and private self catering holiday home situated a 100 metres from the Crocodile river view in Marloth Park, which river forms the southern boundary of the Kruger National Park which sleeps a maximum of 6. The house comfortably sleeps 6 people in two airconditioned, en-suite bedrooms (double beds) as well as a bunk bed with open plan kitchen, with splash pool. Sanbonani also cater for game drive in the Kruger Park. 442 page views since 07 Nov, 2018. Last updated on 29 Jan, 2019.